An oblique view of Mount Sharp, where Curiosity is expected to land in August 2012. There's a formation on Mars that's been enticing scientists since it was first observed in the 1970s: Mount Sharp, in the middle of Gale Crater. If Gale Crater sounds familiar, it's because that's where the Mars Science Laboratory - Curiosity - is slated to land in August of this year. Curiosity is the first Mars rover to even attempt to land on the narrow strip of flatter ground at the foot of Mount Sharp, thanks to precision-landing technology on the one-ton rover. So why is Mount Sharp such an interesting target? Scientists hope that by studying the roughly 5-kilometer-high formation, (3.1 miles) Curiosity will be able to shed more light on whether conditions were ever favorable for life on Mars. Just to give you an idea how tall this thing is, the Grand Canyon is only a mile (1.6 kilometers) deep according to the National Park Service. Georgia Tech's James Wray, a science team collaborator for the Curiosity mission, tells us that Mount Sharp has kilometers of sedimentary layers that could reveal clues to millions of years of Martian geologic history. As on Earth, where geologists study formations to understand how they fit into the stratigraphic - that is, chronologic - history of the planet, Mount Sharp presents an opportunity to do the same on Mars. "Mount Sharp is the only place we can currently access on Mars where we can investigate this transition in one stratigraphic sequence," said Caltech's John Grotzinger, chief scientist for the Mars Science Laboratory, in a statement. Wray likens it to "reading thousands of successive pages from an encyclopedia of Martian history." Mount Sharp is an apt name - in the tradition of naming Martian features after scientists (Gale Crater was named for Australian astronomer Walter Gale), the mountain is named after a geologist, Robert P. Sharp, who was at the forefront of planetary science and a member of NASA's first few Mars missions. I would have rather them landed at the foot of the face on mars !! The peak being higher is the major reason and to think that the outer rim would erode at a faster rate than mt, would that not mean the material of mt harder. less dense? Internal pressure? Can't wait to see the photos. Gonna be AWESOME! 3 mile high mountain??? that sounds like a challenge to me! Why not try something more ambitious and land in the 2500 x 4 mile deep canyon in Mars (Valles Marineris canyon system)? With such a deep scar your bound to find something interesting. Maybe even Martians bugs washed into the canyon biliions of years ago. Has anyone taken a really close look(or stepped back a pace) at the surface of MARS? Can't you people see them? From all of the pictures NASA has released to the public, there are so many CLUES in the photos. I'm not a rocket scientist, but even I can see them. Come on people, they were put there on purpose for your viewing pleasure. Clue: FACES!! There is also a 'face' in the moon. Should we be aware of some message there, too? Yeah, the message is that aliens are fans of Rod Stewart. You Earthlings are messing up your own planet! Beware! Actually, the face said something different than 'messing', but this is a family-oriented web-site! Recently I heard a scientist speak on this landing, and he added some interesting details not present in this article. One, the radiation bombarding Mars has certainly destroyed any possible fossils on the surface, so trying to drill from the surface will be a waste of time. Two, the drill being carried is relatively short, so the drilling on the surface would not be able to drill deep enough to get to a depth where fossils might exist. Three, therefore, the purpose of landing in a deep crater is to allow a small drill to drill sideways into the layers of Martian soil that due to the angle will have been shielded from damaging radiation that would have destroyed fossils on or near the surface. You know what will happen if we build a prison there? The president or his daughter will visit and get held hostage and we'll have to send Snake Plissken in to rescue them! Let's send all these dumb and criminal politicians there along with lets say some convicted child murders and rapists and they can start a prison colony there and work to supply earth with martian gold and silver and maybe some martian weed!!!! John Carter has climbed to the top of this mountain and reports that Woola was unable to accompany him as Woola is deathly afraid of heights. Why ruin a good science article by mentioning such a terrible movie? Excellent mission. I've been pining for a Mars mission that looks at sedimentary deposits for several years for exactly these reasons. It's the best place to examine the planet's past over a huge swath of time, and – if we're very lucky – it might be a place where fossils could be found, although it isn't clear to me that the mission could effectively prospect for them. It's probably a rebound peak. When the crater was formed, most of the energy radiated outward, forming the crater. At the center of the impact the crust was forced directly downward then rebounded upward, creating the peak. This is a common feature on the moon as well. Which is exactly why they want to go to this crater. The layers of sediment will no doubt be boundless. What if the crater were really a caldera.....e.g. there are mountains in the Caldera at Yellowstone. Just sayin'. Actually, that is why they're going there. It shouldn't be taller than the crater rim. Yes, normally, there is a rebound peak in the center of large craters, but it is by definition not as tall as the rim. The fact that it is taller than the now eroded rim of the crater means when the rim was taller, the mountain was laid down as sediments. It was left behind later, when the rim and the rest of the crater partially eroded away, leaving an awesome mountain of sediments – like a 3 mile storybook of martian history for the area which could tell scientists a lot. Mars is such an interesting planet, I wish we would hurry and send a manned mission there. Humor–send Newt Gingrich (of moon colony fame.) Seriously, can we afford this? If so, space missions do result in research gains with spillover benefits. NASA's yearly budget typically amounts to 0.4% of the total annual federal budget. Or, think about it this way: The total budget for NASA over its 50+ year history amounts to about what we have spent on the Iraq war. I'd say we get our money's worth out of what we spend on NASA. I'm guessing that if it weren't for stupid politicians and their stupid wars, we'd already have been there by now. I don't know about that precision landing system. The descriptions I have read of it make it sound a lot more like a rube goldberg landing system. I do hope it works, but it seems to me the design includes a near infinite number of things that can go wrong. I thought mars landing technology reached its peak with the crash baloons they used on Spirit and Opportunity :-). The baloon system was very good, but the mass of this lander is far greater than Spirit/Opportunity, so the baloons were not be feasible. Plus, the balloons resulted in the landers going many miles off course, because of the bouncing around. They need this new system to have the new rover land in a relatively small ring around that huge mountain (and still be in the crater). I have a question. In this article, Mt. Sharp is listed as 3.1 miles, or 5 kilometers tall. Then its compared to the Grand Canyon in the US which is "only a mile (1.6 kilometers) deep". Why was this confusing exercise in apple/orange comparing done in the first place? As I remember my math, a mile is 5280 ft, right? Mt. Everest is 29.028 ft. Why couldn´t the author have simply written, "Mt. 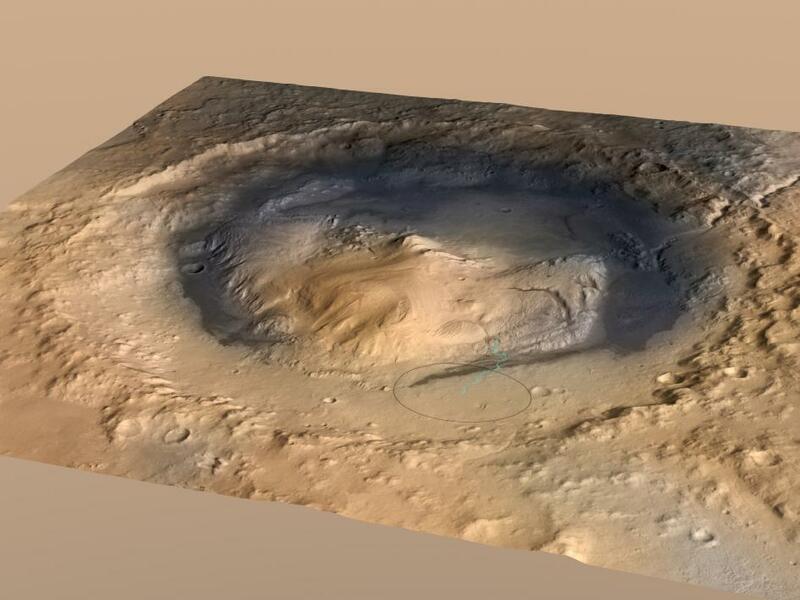 Sharp on Mars, at 3.1 miles or 5 kilometers tall is a little over half the size of Mt. Everest." Much simpler, no? Yours is a good point. But Mtns on Mars would measure differently than earth mtns since ours are measured from sea level...and last time I checked Mars had no sea level. Perhaps a calculated one? Well, let´s see..."ground level" would be a place to start, no? The point is that comparing DOWN makes no sense when comparing mountains which rise UP. I agree... I just wonder how researchers define Martian ground or sea level. Yes...however, they list Mt. Sharp as "5 kilometer high"...Higher than what? Obviously they have a measuring scale. It's actually called the Datum. It is comprised of an "Average" of all the heights on Mars. So "Sea Level" would be called Datum. Datum makes sense.....It's just a base line where every thing is measured from. It is primarily used in engineering to tell a machinist that all demensions start at the datum surface of the part to be machined. You no fool me, Chad! Datum is the android on Star Trek! Or better yet "the hightest point in the lower 48 states, Mt Whitney, is14,495' tall – about 900' shorter than Mt Sharp". See...that´s exactly the kind of better comparison which is far more evocative (to USAmericans, anyway) Excellent! For a more world applicable example, they could have chosen any similarly sized 14-15K ft. peak and done the same. I totally agree with you. Science writers try to be too cute with comparisons, which, I'll admit, are useful. And, occasionally even the comparisons have to be complex. This was a simple apples to apples situation that was totally flubbed. USE OF MKULTRA + HUNGER GAMES TODAY....STATE OF THE ART EXPLANATION ON MIND CONTROL TECHNIQUES(violent world of government psychiatry/psychology and police revealed..... learn exactly per how is done and by whom... use of psychology/psychiatry for mass population or ethnic cleansing as well as crimes to which we witness daily on behalf of Zionism/communism/liberalism). SELF ELECTED GOVERNMENTS GOING AS FAR AS USING PEDOPHILIA TO RESOLVE THEIR MINDLESS CRIMINAL POLITICAL ISSUES AGAINST TARGETED VICTIMS WHILE BLAIMING IT ALL ON CHURCH !!! REAL 911 REVEALED !!! COMING NEXT....LEARN TRUTH ABOUT RUSSIAN COMMUNIST APPARATCHIK ALIKE GANGSTER AND TRAITOR DAVID DUKE OR 70 YEARS OLD US GOVERNMENT OBAMA NEWS(including Eastern European Ethnic cleansing for the sake of Slavic super state or Soviet Union number two). WHY TO TALK ABOUT MIND CONTROL WHEN WE ARE DEALING WITH ETHNIC CLEANSING(that is exactly why they insist us talking about mind control !!!). All related to WHITES ARE NOT WELCOME IN AMERICA ANY LONGER !!! http://www.youtube.com/user/BostjanAvsec or rather http://www.dailymotion.com/video/xleq3o OBAMA'S HEALTH CARE RECORDED LIVE IN 2009 !!! EXILING WHITES(US citizens) WITH EXTREME PREJUDICE AND IMPORTING NON WHITES IMMIGRATION REQUIREMENTS FREE !!! WHY TO ACCEPT LIABILITIES FOR CRIMES COMMITTED WHEN WE CAN SIMPLY ASSASSINATE OUR VICTIMS(YOU) THANKS TO HUMAN RIGHTS ORGANIZATIONS AND FREE PRESS/MEDIA(most severe CENSORSHIP OF GENOCIDE in entire history of human kind) !! NOT HUMAN RIGHTS COURTS, BUT ORGANIZERS OF GENOCIDE AGAINST WHITES AND SPONSORS OF BOGUS "MULTICULTURALISM" $$$ CLAIMS AT EXPENSE OF PERSECUTED WHITES(while minorities are awarded for and instructed by governments in bogus human rights claims, whites are simply killed if not perverted in multiculturalism garbage) !!! Seriously, do crazies like you just pick random articles to spout nonsense at? Please stay away from local events with your Representative at Safeway. I hope you receive help today. Please remember that when using our design for "tin foil hat" you MUST use tin foil. Aluminum foil WILL NOT WORK! Dear Avser Bastian: I think the idea of putting something down in writing is so that it will be in a form that others will understand. It appears you forgot that part. Wow. I guess you've just proved that ANY idiot can learn to use a computer. This is what schizophrenia looks like in print. you won't get better without the meds my friend. Let's play Spot the Loonie! Oh! I think I just spotted him! Don't pat yourself on the back too much. That was about as difficult as spotting the sun on a cloudless day. To be honest, I'm not raelly sure. Drawing the object on top of the shadow is not such a good idea, because it may cause shadowed objects to actually be drawn (like object lying in the shadow of other objects, and so on)What would probably be best on the long run is the idea to also assign a height when first processing the shadows, and when drawing the objects, only apply shadows on objects lower than this height. And an object is set to be a little higher than its own shadow. This would probably lead to the best result, where small objects don't case shadows on objects larger than them. But it would also mean rewriting the way shadows are combined with the scene, adding a bit more shader complexity.